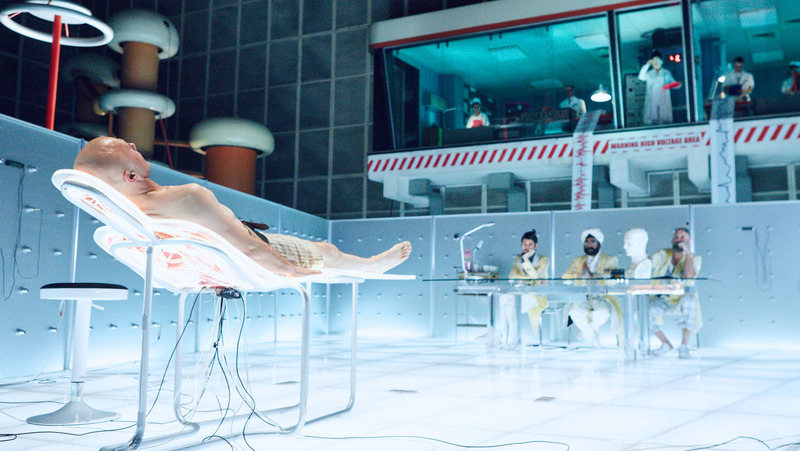 The Zero Theorem – 2013 | We Can't Hear the Mime! I went into The Zero Theorem from the starting point of having watched nearly every Monty Python sketch ever written and having seen only The Imaginarium of Doctor Parnassus out of Gilliam’s independent work. I was aware that the back-catalogue of his work had been met with…. mixed reception, to say the least. However, I was optimistic. The Zero Theorem was not worth the benefit of the doubt. You can be forgiven for being enticed by stills of this film. It has a glittering cast, including cameos from Matt Damon and Tilda Swinton, and swish, futuristic sets. It is designed to look good on paper. It would have been great if the amount of time, energy and money had been spent on script or plot substance as was clearly spent on cast and set design. The first twenty or thirty minutes of this film are an exciting journey into a parallel, psychedelic dystopian future, complete with concepts stolen from Minority Report and basically every other dystopian future the world has ever known. Inevitably you eventually get bored of the basic exposition and high-budget sparkle, not to mention Christoph Waltz’s incredibly mannered performance as Qohen (because of course, in this future accepted rules of orthography and pronunciation are totally irrelevant). At this point you wait for the plot, or the narrative meaning to kick in and take over. It doesn’t. Gilliam leads us up dead end after dead end, a love interest (Mélanie Thierry) that Qohen spends 90% of the time not actually being romantically interested in, a new rendition of “arrogant over-priveleged boy genius” from Lucas Hedges, but nothing that really gives you a reason to continue being interested in the inherently irritating protagonist. As the film progresses the film’s aesthetic even begins to seem tragically dated. Bad CGI, “futuristic” images of what are essentially iPads and a comical central computer which resembles something from a bad Star Trek episode. Only this time it’s not cardboard, it’s precious processing power and carbon emissions which were wasted rendering it. Even the ideas seem tragically out of touch, worries about internet privacy and the danger of virtual reality have long become our day to day lives, not the reserve of edgy independent films. It’s like someone showing up at a party and earnestly informing their friends about the dangerous rise of text messaging. Of course there’s a political message too, Qohen is at great pains to point out the fallacies of boxing off workers to do repetitive tasks that they do not understand the full purpose of, kind of like the problems faced by production line workers in the early 1900s. These ideas mesh and eventually devolve into some kind of condemnation of both religion and nihilism while providing no answers and no satisfying conclusion. Ultimately The Zero Theorem, despite it’s potential and delusions of grandeur, goes nowhere and says nothing. This entry was posted in Cutting-Room Floor, Film Reviews, London Film Festival 2013 and tagged 2013, Christoph Waltz, London Film Festival, Lucas Hedges, Mélanie Thierry, Terry Gilliam, The Zero Theorem on October 27, 2013 by Flo.